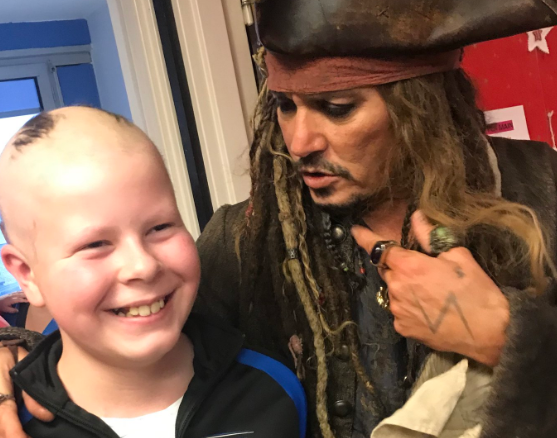 Mr Depp, dressed as Jack Sparrow - one of his most famous character roles, from the blockbuster movie franchise Pirates of the Caribbean - visited for three hours on December 27. The actor spent time meeting and speaking with patients and staff, before posing for photos that the Institut then posted on its social media accounts. Veteran actor Mr Depp is best-known for his roles in Hollywood films such as Edward Scissorhands, A Nightmare on Elm Street, Fear & Loathing in Las Vegas, Sleepy Hollow, Chocolat, Benny & Joon, Sweeney Todd, Alice in Wonderland, Blow, and What’s Eating Gilbert Grape; as well as the five Pirates of the Caribbean installments. He has previously been known for his love of France, and was in a 14-year relationship with French actor Vanessa Paradis, with whom he had two children. The Paris visit is not the first time Mr Depp has shown generosity towards children’s hospitals; in 2007, he donated £1 million (€1.10 million) to London’s Great Ormond Street after it cared for his daughter Lily-Rose following a severe E.Coli infection. The couple was known to spend significant time in France during their relationship - especially in Provence, where the actor owns an 18th century hamlet near Saint-Tropez. The property, which includes two swimming pools, a gym, a wine cellar, bar, restaurant, olive groves and a vineyard, is now on the market with high-end estate agent Christies, and is being sold at a rumoured price of €50 million.